Favorite Credits: Performance - The Knock-out Blow (Half Straddle), Room for Cream (Dyke Division of 2HC), Drum of the Waves of Horikawa (Theatre of a Two-Headed Calf), reading Lukewarm Pretzel: A Man on New Year’s Day at the Poetry Project as Joe Ranono. And I manage an up-and-coming comedienne named Karen Davis. Why theater? : It’s become a sick addiction to the lifestyle, I think -the instability, the highs, the lows, poverty as a point of pride. The truth is, I like getting to make my own family. And I really like how everyone has to show up on every level, be it terrifyingly or gently present. And I really, really like how hard it is to do well. Tell us about Good Year for Hunters: Good Year for Hunters is a play I conceived of with my longtime collaborator Chris Giarmo about five years ago, when I was first starting grad school. I proposed we write a script using Tori Amos’ Little Earthquakes as the source material. What emerged was this apocalyptic horror show about growing up queer and closeted. There’s a brother and sister who we discover are mysteriously (or just inexplicably) orphaned and they’re having an affair with a neighboring couple. It’s a coming-of-age story, but everyone is in this state! There are lots of different kinds of romance in the piece and I hope Chris and I have been able to tease that out as directors. The original draft has definitely evolved over these last years and after an initial workshop in early 2012, I really tore the ending apart. I think we have made something ultimately sadder and more honest about loss and irrevocable choices. I still want to think of it like a comedy though. Comedies are often the saddest expressions. What inspired you to create Good Year for Hunters? : When I was a kid I wanted to be a sculptor because I thought it would be an elegant way to function as an artist. But then I discovered the Tracey Ullman Show and was utterly hooked. I was largely parented by a television set and I got really turned on by serials. And then I discovered SNL and started to have some sense of what it would be like to do performance live. I also have to give a shout-out to my high school drama teacher Lisa Byrne. She seriously encouraged me to pursue my theatrical goals and actually brought me to my entrance audition at NYU. What kind of theater speaks to you? What or who inspires you as an artist? : I like theatre that feels really intimate, like Faye Driscoll’s last show at the Kitchen. The theatre is a romantic space of temporary agreements. I agree to be with you for x amount of time. I agree to love you today in this moment, scene partner. I like to feel a history between people when I see them onstage together. I also enjoy some versions of self-conscious performance. Inspirations: Julia Jarcho’s last play Dreamless Land (neo-Shepardian awesomeness, I thought I could feel the west opening up for me by the end), David Lynch, Mike Kelley (RIP) Ann Liv Young for just being an artist and living that, Tina Satter of Half Straddle (the hardest working woman I know, amazing leader, I love her mind), poetic essays, my part-time muse Emily Davis, my friend Ariel Goldberg. If you could work with anyone you’ve yet to work with, who would it be? : Ivo van Hove, maybe? I was in a rehearsal room with Jay Scheib for a couple days developing a show and ultimately had conflicts, but I think it would be fun to do a full production with him. Richard Maxwell. Actors - I really think Lucy Taylor was amazing in ERS’s The Sun Also Rises. All the designers for that company are amazing and that would be a cool collaboration, although I am loyal to my lighting man Zack Tinkelman. And Chris has done sound work for most of my shows. Didi O’Connell - dream actor, Bridgett Everett - she is a powerhouse and I would love to see more of what she could do in different containers. What shows have you recommended to your friends? : The last few shows that have come through Incubator Arts Project, I really enjoyed. Normandy Sherwood’s The Golden Veil is happening at The Kitchen and I think it’s a fascinating script and gorgeous set. Big Dance Theater’s revival of Comme Toujours Here I Stand I thought was better than when I saw it the first time … the problem with most things I like is that they have very limited engagements. I certainly would recommend keeping an eye out for Tina’s Seagull happening at COIL next year. I participated in the last work-in-progress and I think she’s really taken her game as a writer to another level. Who would play you in a movie about yourself and what would it be called? : Tilda Swinton’s too tall and not butch enough. Maybe Kid Krule would make a crossover to star in my movie. It’s called "My Metrocard Has Expired Again". What’s your biggest guilty pleasure? : It’s a toss up between Jack Daniel’s and this movie called Wave Babes. If you weren’t working in theater, you would be _____? : Pursuing a PhD in English probably. What’s up next? 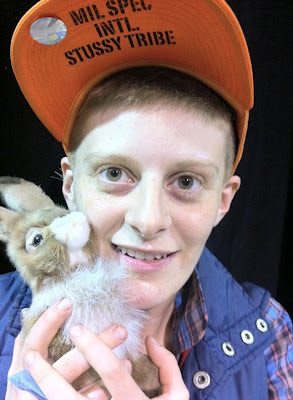 : The day after Hunters closes I begin a residency at BAX to develop a new play called Jess and Joss Are Doing Well. And also in July, I go into rehearsal for a new show with Big Dance Theater set to premiere in Hartford early next year.